I went on a quest to find the best running shoes for Morton’s neuroma, and these are my top five picks. I have always been a believer in the ability of Altra to deliver some of the best running shoe designs in the industry, and I wasn't disappointed. The Altra Torin 3 is a highly cushioned, lightweight running shoe that has high breathability and comfort. For Morton's Neuroma sufferers, wide toe box shoes allow your toes to spread out which may reduce the pain from compression. For Morton's Neuroma sufferers, wide toe box shoes allow your toes to spread out which may reduce the pain from compression. Compared to its predecessor, the Instinct 4.0, the Torin 3.0 is about 2 ounces lighter and has a higher cushioning level. The upper of the shoe really locks your foot down which ensures your foot is firmly fit yet not too constricted. I feel that this improvement makes it a better choice for combating the symptoms of Morton’s Neuroma. Pricewise, Torin 3 is very affordable and delivers quality, especially for someone who wants breathability and comfort. Another great thing about this shoe model is that it comes in different colors to fit both male and female runners. The second on my list is the Saucony Hurricane ISO 2 Running shoe, mainly because the cost is quite similar to the Altra Torin 3. The Hurricane ISO 2 can be considered a stability shoe considering the high amount of support it provides. I also found the shoes very responsive while running. Another feature that caught my attention is the zig-zag trail pattern on the sole which provided a very firm grip and prevented any sliding. If having a fancy looking yet durable upper is important for you, you will love the Hurricane ISO 2 upper. It has thick overlays that hold your feet well. The RUNDRY collar lining of the shoe was of particular interest to me since I have sweaty feet. This lining offers moisture control and helps prevent odor. Another useful feature is the flexibility of the shoe – POWERGRID + technology of the midsole ensure this with great success. If you don’t like the Altra Torin 3 for whatever reason, I recommend you opt for these as a second choice. For a running shoe that below the $100 price tag, this model is definitely the option I would recommend. Despite the super affordable cost, the M980 Boracay Running Shoe has excellent technology behind it. Categorized as a neutral trainer, the M960 is designed to help you push your pace. Although it doesn’t provide very much cushioning, I loved the high energy return it offers. Another feature that impressed me was the grip on the outsole. The patterned rubber pieces improved the flexibility of the shoe significantly. The shoes performed well on different surfaces – from gravel to snow and ice. If versatility is something you value, these shoes are an excellent place to start. For mid to forefoot strike runners like myself, the 4mm drop is a great help in propelling you towards your next step. The upper of the shoe is very breathable, and I was able to twist and move my foot around any way I wanted. For those who don’t mind spending a little more as long as they are assured of a great buy, the Brooks Ghost 10 is the shoe to try. Although I am more of a budget-friendly buyer, these shoes are really worth this money and are one of the company's biggest sellers. One of the first things that struck me was the very comfortable underfoot. The shoe uses the signature BioMoGo DNA foam in the midsole which is designed to adapt to your landing and displace foot pressure. I also appreciated the flexibility of the shoe which was thanks to the fully segmented sole. Compared to its predecessor Ghost 9, the Ghost 10 also features structured midsole support in the upper which allows more mid foot support while maintaining breathability. When you suffer from Morton’s Neuroma, the number one thing you should be concerned about is finding a shoe that is neither too roomy nor too narrow. So when you are looking for the best running trail shoes, adjustable fitting shoes are the best option. I was impressed by the flat lace network that provided a glove-like fit. Another great feature of the Merrell Glove 4 is the zero drop which is not typical for minimalistic shoes. Very low or zero drop shoes provide the sensation of running barefoot which is a feature Morton Neuroma sufferers need. For those who want something that allows your foot to move around freely, the flexibility provided by the Merrel Glove 4 should impress you. The shoe is flexible while still allowing some resistance to flex with the hard rubber outsole. One thing I found to be unique about this shoe is the tongue. Instead of the usual design of being separate, the tongue is a continuation of the upper on the inside of the shoe. There is a small elastic ribbon at the edge of the insole that holds it in place. Also referred to as metatarsalgia or interdigital Neuroma, Morton’s Neuroma occurs when a nerve in the foot becomes irritated and thickens. This can cause severe pain that is usually felt in the area between the third and fourth toe. Stress fractures occur between the second and third metatarsals in the foot which are thinner than the rest. This is also the location that experiences a lot of impacts when you run. As long as the stress applied to the bone is decreased, the fracture will heal in no time. A neuroma, on the other hand, is a more permanent condition. Since the nerve is compressed every time you put weight on it, it swells and may never heal. The best way to prevent this is to always consult a professional when you feel pain in your foot. Making sure you diagnose a Neuroma as fast as possible is the key to early treatment. Using an elliptical trainer may be the first option. This is where the problem arises. Using an elliptical trainer means that the ball of your foot pushes on the pedal constantly which can aggravate the neuroma. Another activity runners may choose is cycling. Cycling shoes, however, are designed to be stiff and narrow. When you have a neuroma, wearing such shoes only compresses the nerve further. In addition, the faster you paddle, the more stress you put on your foot, pinching the nerves. To prevent this, have yourself diagnosed first before deciding to self-medicate with cross training. The sensation of having something stuck in your foot when running. At this stage, the nerve is mildly irritated and not damaged yet. Fluid is collecting around the nerve and causing this sensation. Numbness in the middle of the toes or ball of the foot. This happens because of the accumulation of fluid around the nerve. Burning, tingling pain. This is when the nerve has been compressed for an extended period of time. The bottom line is that if you experience any of the mentioned symptoms of pain especially in the ball of the foot or in the area between your toes, you need to consider that you have a neuroma. Another thing to remember is that if your discomfort doesn’t get better quickly, you probably don’t have a stress fracture. You need to make sure that you are diagnosed as soon as possible or else you will experience chronic pain which might take a significantly longer time to heal, and even involve surgery. Clearly, early diagnosis is the first step to recovery from a neuroma. 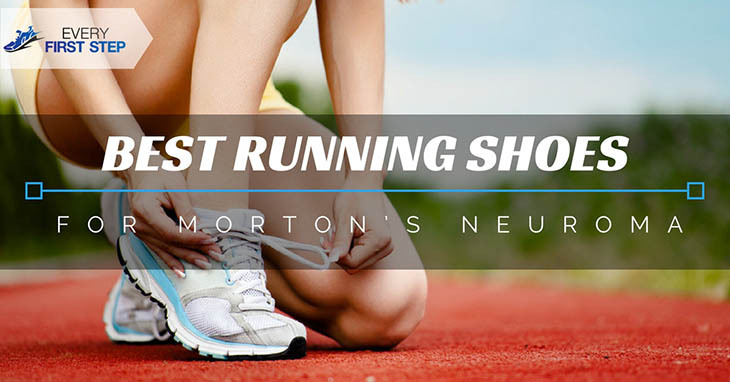 The next crucial decision to make is selecting the best running shoes for Morton’s Neuroma. An ideal shoe for this condition should most importantly have a wide toe box, proper arch support, low drop and be easily adjusted. For this reason, the Altra Torin 3 is my personal favorite. The lightweight design provides less stress to your foot while the high cushioning keeps your foot comfortable. Its upper gives you the perfect fit without constricting your foot. On top of all that, the price is just right.